A weekly staple in our house is burrito night. It's a quick, healthy dinner that takes hardly any time to prepare and most likely everything is in your fridge or cabinet. Normally we have black bean burritos sometimes with rice or a side salad. I wanted to switch it up this week and decided to add a sweet potato. It was delicious! Cook the sweet potato in a skillet until slightly soft, add onions and cook until translucent. Finally add corn and black beans. 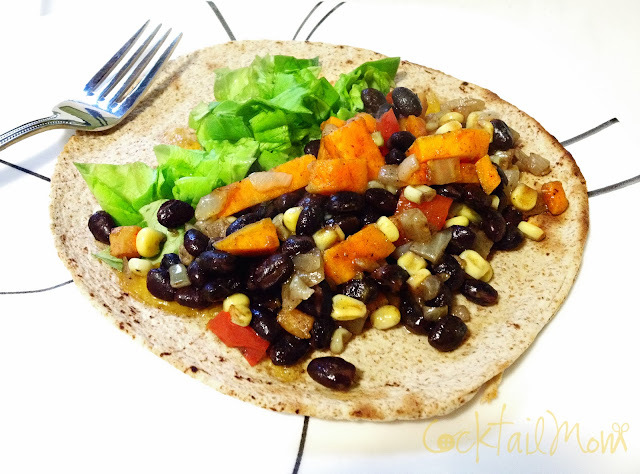 Serve in a whole wheat tortilla wrap with shredded lettuce. Enjoy!